Catherine van Wilgenburg’s recent works of suburban landscapes of Cairnlea, Victoria are layered with first white settler images and text from the journals and notebooks of John Batman (the founder of Melbourne along with John Faulkner) & John Helder Wedge’s (Batman’s Surveyor General) explorations of Victoria’s western grasslands. These paintings juxtapose the earliest European images of indigenous people of the western region of Melbourne (known by the earliest settlers as Iramoo) with contemporary suburban images on the same land at the Cairnlea and Caroline Springs we know today. Such juxtapositions suggest early settler beliefs about this land & indigenous cultures still hold power. They are the artist’s response to this inheritance with the need to connect with this land and indigenous peoples through her work with the Friends of Iramoo at Iramoo Wildflower Reserve, St Albans. In ‘Women collecting murnong’ the silhouetted figure of Annette Xiberras, a Wurundjeri elder of Iramoo (Woiworung for grassland & meeting place) is juxtaposed with field sketches of indigenous women from John Helder Wedge’s fieldbook manuscript of 1834. The McMansions of Caroline Springs are super – imposed. 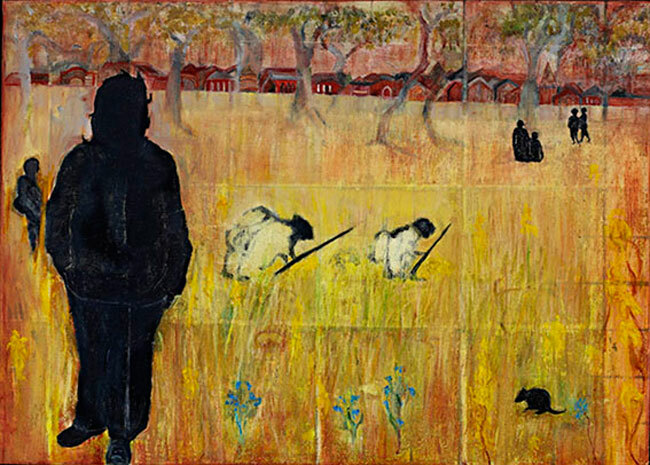 Wedge’s field sketch image ‘Women collecting murnong (Yam Daisy’) is a recurring theme occurring in all three works. This entry was posted in Architecture and tagged RECONCILIATION on May 30, 2011 by admin.